This 15.6-in. system delivers great performance and long battery life. The Dell Precision 3530 is a full-size 15.6-in. mobile workstation that packs lots of power in a package that weighs just over 5 lbs. Image courtesy of Dell. Computers, servers, data storage devices, network switches, software and more. Although we have recently reviewed quite a few Dell workstations, it has been a year since we last looked at one of the company’s mobile systems (see DE January 2018). 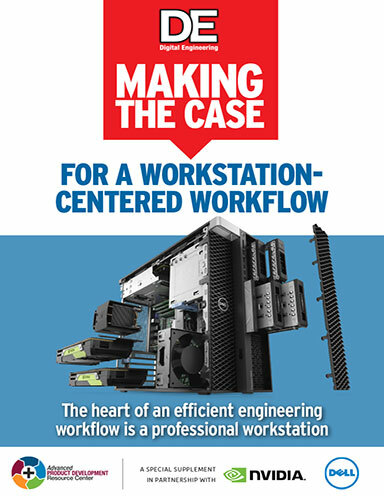 We were therefore quite pleased when Dell offered to send us a new Precision 3530 mobile workstation. 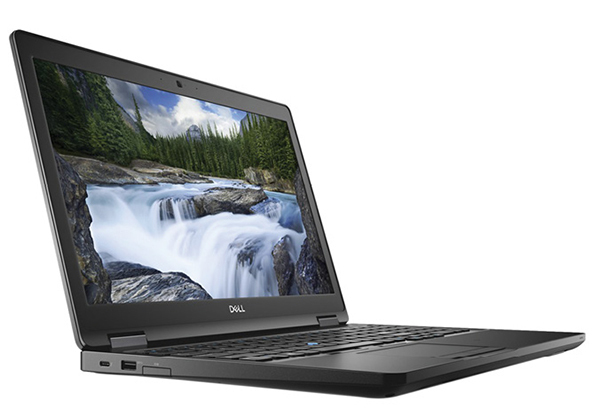 The Precision 3530 is Dell’s latest 15.6-in. mobile workstation, powered by an 8th-generation Intel Core or Xeon processor. Unlike the thin Precision 5520 we reviewed last year—which bore a striking resemblance to a MacBook Pro—the Precision 3530 is a full-size system measuring 14.80x9.87x0.9 in. and weighing 5.17 lbs., plus 1.32 lbs. for its 130-watt external power supply. With prices starting at $889, the Dell Precision 3530 offers true workstation performance without breaking the bank. The base configuration is for a system equipped with a 2.5GHz Intel Core i5-8400H quad-core CPU, integrated Intel UHD 630 graphics, 4GB of RAM, a 500GB 7200 rpm SATA hard drive, a 1366x768 anti-glare non-touch display, a non-backlit keyboard and a 1-year warranty. But that’s just the starting point. Dell offers the Precision 3530 with a choice of one of five available Coffee Lake CPUs. The evaluation unit we received was equipped with an Intel Xeon E-2176M processor, which added $362 to the base price. This 6-core CPU, with a 12MB cache, has a base frequency of 2.7GHz and a maximum turbo speed of 4.4GHz while maintaining a thermal design power (TDP) rating of just 45 watts. Although all available CPUs include integrated Intel graphics, our evaluation unit also included an NVIDIA Quadro P600 graphics card. This graphics processing unit (GPU), which includes 4GB of GDDR5 dedicated memory and 384 compute unified device architecture cores, is the only discrete GPU option offered on the Dell Precision 3530. Although it would normally add $94, this GPU is automatically included when selecting the Intel Xeon CPU. Opening the sculpted charcoal gray case reveals the 15.6-in. display and a 103-key keyboard and numeric keypad with mostly full-size keys. The keyboard on our system was backlit, a $35 option. A touchpad with two dedicated buttons is centered below the keyboard, while a pointing stick is nestled between the G, H and B keys and has its own three buttons directly below the spacebar. The keyboard had an excellent feel and ample key travel. Although the display resolution in the base configuration is just 1368x768, Dell offers a choice of seven 15.6-in. display/camera combinations, including a 1920x1080 43% color gamut display with touch and an infrared camera. Our system included a 15.6-in. FHD WVA 1920x1080 anti-glare non-touch 72% color gamut display, with an infrared camera and microphone centered above the display, adding $125. The Precision 3530 has two memory sockets and can be equipped with up to 32GB of RAM. Non-Xeon systems can only use non-error code correcting (ECC) memory, while Xeon-based systems can use either ECC or non-ECC memory. Most of the Xeon-based systems we’ve received over the years have included ECC memory, but the Precision 3530 Dell sent us included 32GB of DDR4-2666MHz non-ECC SDRAM, adding $506. That same amount of ECC memory would cost $49 more. Dell offers a choice of 16 hard drives, including SATA drives ranging from 500GB to 2TB and M.2 drives from 256GB to 2TB. The system we received came with a 512GB M.2 PCIe NVMe Class 50 solid-state drive, adding $417. The system can support one 2.5-in. drive and one M.2 drive, or two M.2 drives. Depending on the primary drive, secondary drive options include SATA drives of 500GB to 2TB and M.2 drives from 256GB to 512GB. Dell also offers several different wireless options. Our system included an Intel dual-band wireless AC 9560 802.11ac MU-MIMO Dual Band 2x2 plus Bluetooth 5.0, with no additional charge. The Dell Precision 3530 offers ample ports. The right side includes a headphone/microphone combo jack, an optional SIM card slot, one USB 3.1 port with PowerShare, a 15-pin VGA port and a security lock slot. The left side houses an optional SmartCard reader, a memory card reader, a USB 3.1 port and a USB Type-C port with optional Thunderbolt support. The case’s rear sports a full-size RJ45 network jack, an HDMI port, another USB 3.1 port and the connection for the external power adapter. Our evaluation unit included a DP Palmrest with a fingerprint reader, SmartCard and Thunderbolt support, adding another $90. The standard battery is a 4-cell 68WHr ExpressCharge-capable battery. Dell also offers a 4-cell 68WHr long-life cycle battery for $35 more. Our system came with a 6-cell 92WHr ExpressCharge-capable battery, which added $49 to the total cost and kept our system running for 9 hours and 26 minutes. Like other systems we have recently reviewed, the battery is not user-accessible. The Dell Precision 3530 remained cool and nearly silent throughout our testing, although the fans became quite audible under heavy compute loads, with sound pressure levels reaching a peak of 46dB. 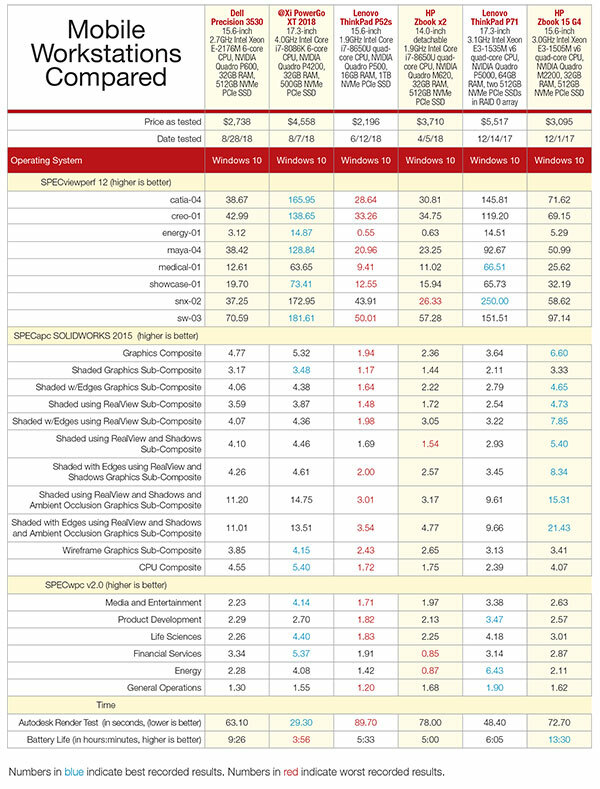 The results for the SPECviewperf test (see page 42) placed the 3530 in the middle of the pack, on par with similar systems from HP and Lenovo but well behind desktop replacement systems equipped with more powerful GPUs. Benchmark results for the Dell Precision 3530 mobile workstation. Click here for larger version. 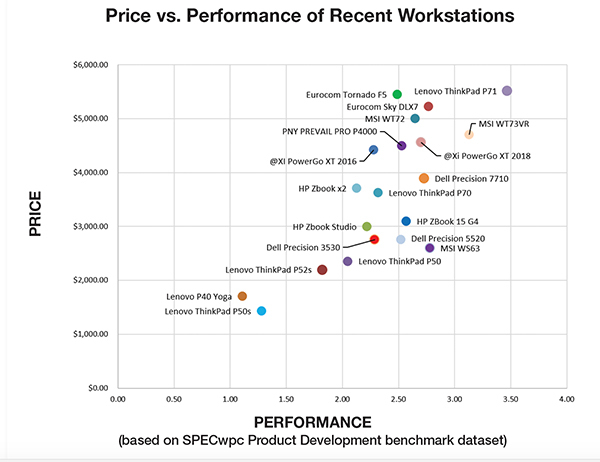 Scores for the SPECapc SolidWorks benchmark were much better, however, illustrating that the Dell Precision 3530 is definitely a mobile workstation capable of running CAD software. On the demanding SPECwpc benchmark, the Dell Precision 3530 performed quite well. Although its results were again mid-pack, it was clearly up to the task. On our own AutoCAD rendering test, the 63.1-second average rendering time placed the Dell Precision 3530 slightly ahead of the other 15.6-in. mobile workstations we have recently tested. Dell preloads Windows 10 Pro 64-bit, but with a six-core CPU you must pay an additional $153 to upgrade the operating system to Windows 10 Pro for Workstations. Ubuntu Linux is also available as an option. Dell’s standard warranty is only one year, not what we have come to expect with a workstation from a major manufacturer. Our price includes $114 to upgrade this to a three-year basic warranty with onsite service. Other support options include up to five years of Pro Support—which includes Dell SupportAssist technology that automatically detects hardware and software issues and proactively alerts customers when they occur—as well as accidental damage coverage and extended coverage of the battery. 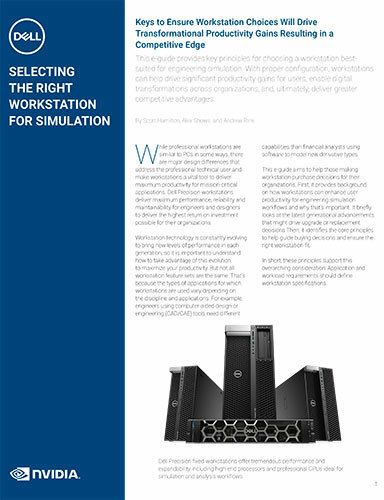 All Dell Precision workstations also include the Dell Precision Optimizer, which uses artificial intelligence to automatically optimize system performance for your current application. The Precision 3530 has also passed MIL-STD 810G tests for ruggedness. As configured, our Precision 3530 priced out at $2,738 with free standard delivery after applying current Dell discounts when we priced it in mid-October. With great performance and a price that won’t break the bank, the Dell Precision 3530 should be a great mobile workstation for any engineer on the go. Paper helps you communicate the causes of your computing frustrations and plots out a path to rectify them. Modern CAM tools benefit from high-end visualization to keep up with faster speeds, more complex toolpaths. Experts weigh in on the best hardware and SolidWorks settings to use in order to maximize engineering design productivity. David Cohn has been using AutoCAD for more than 25 years and is the author of more than a dozen books on the subject. He’s the technical publishing manager at 4D Technologies, a contributing editor to Digital Engineering, and also does consulting and technical writing from his home in Bellingham, WA. Email at [email protected] or visit his website at www.dscohn.com.